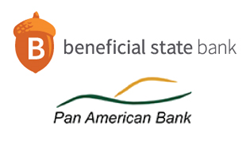 Beneficial State Bank (“Beneficial State”) and Pan American Bank (“Pan Am”) today announced that all required regulatory approvals for the mergers of Beneficial State and Pan Am into Beneficial State Bank have been received. Subject to the satisfaction of customary closing conditions, the mergers are expected to be consummated beginning of June. Pan American Bank, which in August 2015 merged with Finance and Thrift Company, has a long history of serving under-represented and under-served consumers and small businesses. Pan American Bank, co-founded by Romana Acosta Banuelos, the first Latina Treasurer of the United States, was established in 1964. Finance and Thrift, founded by a group of ranchers and farmers to make small loans to their workers, was established in 1925. Pan American is focused on transforming and empowering the community and is nationally recognized as a leading community bank, based on its advocacy-based style of banking. The Bank maintains a fully-bilingual staff (English/Spanish) ready to meet the needs of its customers and is active in the communities it serves through financial literacy education programs to local elementary, middle and high schools, as well as through non-profits and faith-based organizations. Beneficial State Bank is a social enterprise bank founded in 2007 with a triple bottom-line focus of social justice, environmental resilience and economic sustainability. Beneficial State is a state-chartered, federally regulated, for profit banking organization whose economic interest is owned entirely by a non-profit foundation of the same name. Beneficial State is mandated to produce meaningful social justice and environmental benefits in an economically sustainable manner. In December 2010, it acquired ShoreBank Pacific. The merger greatly expanded the Bank’s reach on the West Coast, and enhanced its capacity to serve its mission. ShoreBank Pacific, a pioneer of environmentally sustainable banking, serves both Washington and Oregon. The joint forces produced an enlarged footprint covering a bio-regional territory some call the Salmon Nation and united the synergies of social justice and ecological banking. A few years later in October 2013, Beneficial State Bancorp completed a stock purchase transaction of 90% of Albina Community Bank, bringing a Portland-based community bank that has been investing in individuals, families, businesses, and local neighborhoods over 17 years into their family. Beneficial State has been a certified B Corporation since 2013, and has been honored as “Best for the World”, a designation reserved for the top 10% of all B Corps based on environmental, community and worker impact. Overall, Beneficial State is the #3 B Corp worldwide on the B Corp impact assessment. For additional information, please visit http://www.beneficialstate.com. This press release contains statements regarding the proposed transaction between Beneficial State Bank and Pan American Bank, the expected timetable for completing the transaction, future financial and operating results, benefits and synergies of the proposed transaction and other statements about the future expectations, beliefs, goals, plans or prospects of the management of each of Beneficial State Bank and Pan American Bank. These statements are based on current expectations, estimates, forecasts and projections and management assumptions about the future performance of each of Beneficial State Bank, Pan American Bank and the combined bank, as well as the businesses and markets in which they do and are expected to operate. These statements constitute forward-looking statements within the meaning of the U.S. Private Securities Litigation Reform Act of 1995. Words such as “expects,” “believes,” “estimates,” “anticipates,” “targets,” “goals,” “projects,” “intends,” “plans,” “seeks,” and variations of such words and similar expressions are intended to identify such forward-looking statements which are not statements of historical fact. These forward-looking statements are not guarantees of future performance and involve certain risks, uncertainties and assumptions that are difficult to assess. Actual outcomes and results may differ materially from what is expressed or forecasted in such forward-looking statements. The closing of the proposed transaction is subject to regulatory approvals, the approval of the shareholders of Pan American Bank and Beneficial State Bank, and other customary closing conditions. There is no assurance that such conditions will be met or that the proposed transaction will be consummated within the expected time frame, or at all. If the transaction is consummated, factors that may cause actual outcomes to differ from what is expressed or forecasted in these forward-looking statements include, among things: difficulties and delays in integrating Beneficial State Bank and Pan American Bank and achieving anticipated synergies, cost savings and other benefits from the transaction; higher than anticipated transaction costs; deposit attrition, operating costs, customer loss and business disruption following the merger, including difficulties in maintaining relationships with employees, may be greater than expected; required governmental approvals of the merger may not be obtained on its proposed terms and schedule, or without regulatory constraints that may limit growth; competitive pressures among depository and other financial institutions may increase significantly and have an effect on revenues; the strength of the United States economy in general, and of the local economies in which the combined bank will operate, may be different than expected, which could result in, among other things, a deterioration in credit quality or a reduced demand for credit and have a negative effect on the combined company's loan portfolio and allowance for loan losses; changes in the U.S. legal and regulatory framework; and adverse conditions in the stock market, the public debt market and other capital markets (including changes in interest rate conditions) which would negatively affect the combined bank's business and operating results. Except as required under the U.S. federal securities laws and the rules and regulations of the Securities and Exchange Commission, Beneficial State Bank and Pan American Bank disclaim any intention or obligation to update any forward-looking statements after the distribution of this press release, whether as a result of new information, future events, developments, changes in assumptions or otherwise.